Thin large, crunchy, sweet and delicious a few words to describe these Lemon Cinnamon Torta. The combination of lemon and cinnamon brings something different to the table. 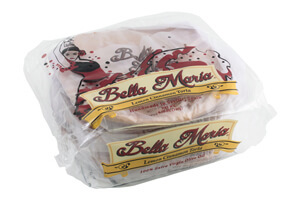 Your will appreciate this variety of the traditional sweet olive oil tortas as it combines a hint of freshness to the spicy touch of natural cinnamon. Light, crisp, and perfectly sweet, enjoy with your morning coffee or afternoon tea. Pair with Aged Cheddar and sliced apples, or a round of Mild Goat Cheese drizzled with honey. For a special treat, serve next to a scoop of vanilla ice cream and a drizzle of caramel sauce. Ingredients:wheat flour, extra virgin olive oil (19), water, brown sugar, yeast, lemon peel, salt, cinnamon powder. May contain traces of nuts (almonds).